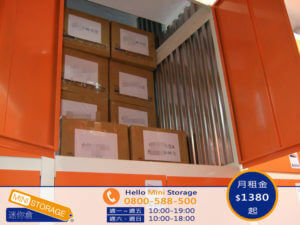 Convenient – Taipei mini-storage facilities offer free and easy access during normal business and weekend hours and often provide 24-hour, 7-day access. Locations are established in high-commerce areas throughout the country and are so prevalent that they provide flexibility for mobile-intensive professionals that serve remote regions, such as salespersons and manufacturers representatives. Secure – Our facilities are manned around the clock and feature security equipment, police monitored alarm systems and fire alarm systems, providing peace of mind. The Right Size – Our units come in many sizes, from 120cm x 120cm; to 240cm x 300cm, or even larger. The most commonly used self storage size for businesses are our 1218 unit. Economical – Typically, the price per square meter at our storage usually is considerably less expensive than that of Taipei office space. Easy Move In/Easy Pay – Occupancy is instantaneous and space can be made available for move in quickly. Payments can be paid by the convenient store like as 7-11 or Family Mart , and often discounts are given to customers that agree on a certain term of occupancy, for example, a price 20% off if customers pre-pay a one-year rental.